If you have any questions or suggestions you are welcome to join our forum discussion about Market Facilitation Index. The Market Facilitation Index (MFI), created by Dr. Bill Williams, is a volatility indicator which aims to determine the willingness of the market to move the price. The indicator’s absolute values alone are of no use to the trader as they provide no trading signals. Instead, it derives its significance from its use as a tool to analyze the price movement’s efficiency by combining price and volume. By computing price movement per volume unit, the BW MFI can help you decide when a trend is strong enough to safely trade it, when a new trend is forming or when to avoid entering the market. It allows you to determine whether the market is liquid and if the different types of market players are active. If market activity drops, then market players using the MFI can see that volume and price movement efficiency are decreasing. The calculations’ results are visualized through a histogram consisting of bars with four different colors, as illustrated on the screenshot below. 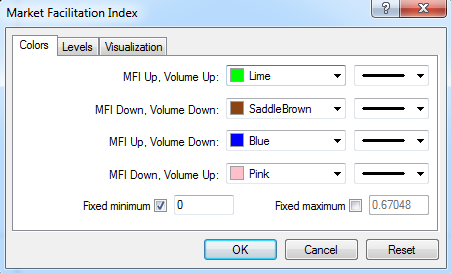 The index’s absolute values are pictured by the bars, while the comparison between the index and volume changes is visualized through four different colors, which are key to reading the signals the MFI generates. 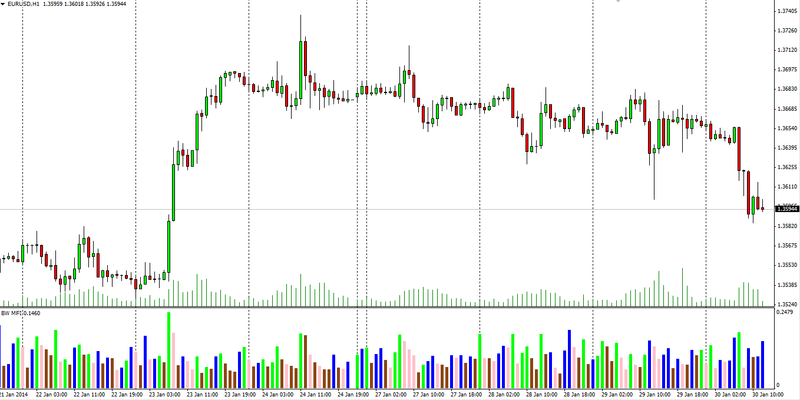 On the screenshot below you can see the MetaTrader 4 menu with the four differently-colored bars. – The Green Market – the histogram’s green bar indicates that both the MFI and volume are rising. This suggests that the market is already on the move and traders should enter a position in the same direction the market is trending, while opposite trades should be closed. A green period occurs when an increasing number of traders enter the market and sentiment supports the current price movement, thus pushing it further in that direction. – The Fade – this condition is visualized by a brown bar. It reflects the end of a trend, when both MFI and volume are declining as the market loses interest in the current price movement and is looking for signs of a future development. Investors are currently indifferent but this bar is a predecessor to a big move. Williams suggests that market players should be watching closely for any signs of building momentum, which in this case can be early signaled by the forming of several consecutive brown bars. – The Fake – this situation is illustrated by a blue bar. It represents a period during which the MFI is rising, while volume is falling. It suggests that the market is making a progressive move, but it is not supported by volume. Due to the lack of interest by traders, they are not supporting the current price movement by opening new positions. This indicates that the price is moving as a result of a certain group (brokers and dealers) of market players’ attempt to control and manipulate the market to their advantage. Such a condition often ends with a price reversal. – The Squat – signified by a pink bar. It reflects a situation when the MFI falls, but volume increases. During this period, a battle takes place between bulls and bears which would determine who will be in control during the next trend. As more and more traders enter the market, volume increases, but since the two counterparts are relatively equally matched, the price does not change significantly. Eventually, one of the contending sides will overcome the other. Since this situation usually occurs prior to a significant move, you should pay close attention to the direction the price takes after breaking out of this slowdown. According to Bill Williams, this is the strongest money maker of the four combinations as a breakout can occur, leading either to the continuation of the current trend or the forming of a new one. Therefore a person who makes the right decision would benefit from a longer price movement and achieve better results.